We recommend that you participate in these activities. Ex¬perience shows that participation in introductory activities helps get students off to a better start, and has large impact on student life at CBS. In 2019 the introductory activities will take place between 19 -31 August. To make sure you do not miss out on anything, you should consider not planning travels, working or other activities within the period. As soon as you are accepted at CBS, you will recieve more information about the introductory activities for the study programme, you are enrolled in. CBS Responsibility Day is the first official day at CBS. 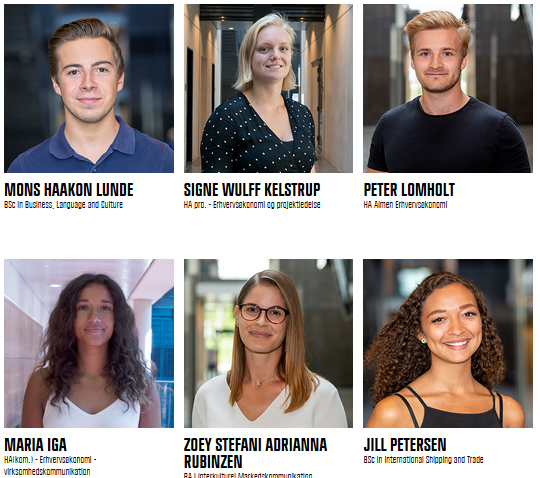 CBS and Denmark are international role models within the field of responsibility in business, and as a student you will be part of leading the way for the future. Therefore the day is about responsibility within education. The day consists of an official welcome ceremony with CBS President and senior management and a case competition for all new bachelor students. Almost all our bachelor programmes have mentors. They are 2nd- or 3rd-year students on the same programme as your¬self. When intro ends and teaching begins, your class will have one or more mentors assigned. They will help you get a good start on your studies and student life. During the 1st year of study you will meet with your mentor, where you and your fellow students will talk about both social and academic experiences and challenges in relation to being a new student at CBS. We recommend that you do not buy books until you have started your studies – either during the intro programme or after the first classes. Teaching materials vary from year to year, and buying the materials early may result in you spending money on the wrong materials. You can buy the books you need in the book store at CBS, Academic Books, or on the internet. At most programmes you should expect to spend 1500 - 2500 Dkr. on average each semester on books. The price may vary from programme to programme and from semester to semester, and some students choose to buy used books in order to save money. Before each semester or quarter begin, the class schedule will be available online. The schedule changes each semester. To access the schedule you need a CBS logon and password which you receive once you are admitted. This means that you cannot access the schedule until you are enrolled as a CBS student. We recommend that you put off buying a computer until after you have started your studies. As a student you will often get especially good offers on computers and calculators. There might also be certain demands on calculators and computers. If so, you will receive further information on this, when you have started your studies. Beginning at a university is a radical change for many new students. You will meet new people and new academic challenges. At the same time you have to familiarise yourself with a new place, new it-systems, rules, regulations and procedures and a lot more. Being a university student means taking responsibility for your own education. There is no compulsory attendance to lectures, you only get grades after examinations and you do not have homework in the traditional sense. Instead you receive a semester plan, containing a reading list with the literature and materials you are expected to prepare, and a list of recommended literature that you can read if you want. You are expected to prepare for classes and to participate actively. Your professors are not teachers, but dialogue partners with whom you can discuss academic content, ideas, get new inspiration etc. What you learn and how much you learn depends on the effort you put into it. The programme often consists of many different courses and assignments, and the workload is hardly ever evenly distributed during the semester. The curriculum is substantially bigger than the one of your upper secondary school, and it may at times seem impossible to get an overview . The teaching styles are also very different from what you are used to, which requires you to work on your study skills. When starting at university, you should be prepared to learn how to be a student. Besides getting to grips with the academic content, you also need to learn to work independently, to take new initiatives and responsibilities, to identify problems and find possible solutions. All in all, it means that you will have to work on your study techniques. Among other things, you need to learn to manage og prioritise your time and assignments, your courses and curriculum, in a way that gives you time for both your studies, spare time and work. You will probably also have to develop or learn new reading and note-taking techniques. You are not expected to master it all from the first day, but to be aware of the new challenges and learn how to approach them along the way. Besides, your fellow students, mentors and student guidance counsellors can help you along.